If you demand the most out of your printer than the Xerox WorkCentre 7970 is for you. Most people never utilize their printer to its full potential, but this is the perfect printer for those who need to be able to handle whatever life throws at them. The Xerox WorkCentre is your multifunction printing solution to all your printing needs. The WorkCentre 7970 is made for those of us who rely on their printers every day. The WorkCentre 7970 has a blazing print speed of up to 70 pages per minute for both color and monochrome. That means that you can get more done in less time. It also has a full color palate as well as the ability to print in tabloid size. This printer is a beast and can handle prints of up to 12.6” x 19”. With a size capacity like that, there is almost no print job you won’t be able to handle. 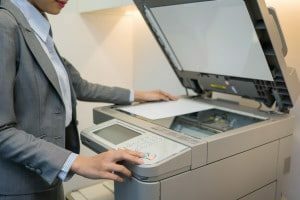 It also comes with a monthly duty-cycle of 300,000 prints, meaning that you won’t have to worry about wearing this printer out. The WorkCentre 7970 also comes with a number of finishing capabilities to help you with whatever you may be dealing with. You can print with confidence when using the WorkCentre 7970. Every feature is there to help you succeed, day in and day out. Don’t waste another day dealing with an inferior printer and get the WorkCentre 7970 today.